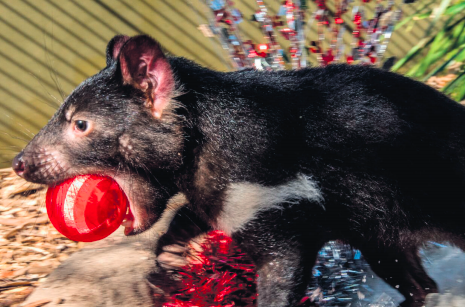 A crowd funding campaign has already raised almost $150,000 for the not-for-profit organisation Devil Ark, a breeding facility started by the Australian Reptile Park, to save the Tasmanian Devil from extinction. If the crowd funding campaign reaches its target of $375,000, Devil Ark will be on the road to double in size. Reaching out to worldwide supporters, Devil Ark received its largest donation from American based conservation organisation, Global Wildlife, who pledged a contribution of just over $100,000 towards the campaign. The Foundation for Australia’s Most Endangered Species (FAME) also contributed $10,000 while the remaining pledges to date have been donated by supporting public. The campaign target of $375,000 covers stage one of development in 2017 required to double the ark. Commenting on the successful campaign, Devil Ark Director, Liz Vella said: “As a registered charity, Devil Ark largely relies on external support from project partners and the general public to maintain the facility. “We’re eternally thankful for all those who donate and are constantly putting a call out to protect the Tasmanian Devil, so we don’t end up with another sad Australian mammal extinction like we did with the Tasmanian Tiger,” Ms Vella said. “We’re thrilled with the start of our crowdfunding campaign. “Reaching just over 30 percent of our fundraising target in three days is amazing. “A big shout out to our American supporters, Global Wildlife, who work with conservation organisations around the world to ensure that some of the least understood, but most endangered species, have a shot of survival. “Global Wildlife’s investment shows the world is watching and taking notice of Australia’s concerning mammal extinction crisis. “It’s encouraging that we’re off to a strong start with the crowdfunding, but there is still a way to go in achieving our stage one goal of $375,000 and hope the rest of the world will rally behind us.” Devil Ark’s mission is to save the Tasmanian Devil from extinction by creating an insurance population of genetically diverse, healthy devils to mitigate the possible threat of extinction due to Devil Facial Tumour Disease.